The game of musical chairs in the St. Louis Cardinals outfield continues. 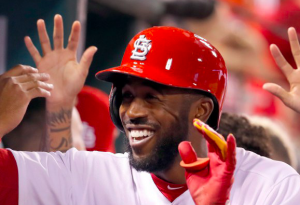 On Tuesday, the Cardinals activated center fielder Dexter Fowler after a two-week stint on the DL. They did so at the expense of outfielder Stephen Piscotty, who was demoted to triple-A. Piscotty becomes the third regular the Cardinals have demoted to the minors this season, joining fellow outfielder Randal Grichuk and shortstop Aledmys Diaz. Grichuk has since returned to the majors, while Diaz has not. Fowler’s return from the DL will be a welcome one for the Cardinals. The center fielder has been slowed by two separate stints on the DL this season. He missed the last two weeks with a wrist injury. But he’s also been bothered by an issue with his right heel spur since his first trip to the DL at the end of June. The hope for St. Louis is that Fowler can return to full health after two weeks off and become a positive force over the final two months of the season. After a sluggish start to the season with his new team, Fowler caught his stride in June before being slowed by the heel injury. Piscotty, meanwhile, has been demoted amidst a most disappointing season. On the season, Piscotty is hitting .232 with just six home runs, well below the 22 long balls he hit last year. He’s posted an OPS of .702 this year. The Cardinals were expecting a lot more from him, especially after giving him a five-year, $33.75 million contract in April. To be fair, Piscotty is just in his second full season in the majors after making his big league debut in July of 2015. However, he hit just .171 in July before succumbing to a groin injury. Since returning at the start of the month, he’s just 3 for 17 at the plate. With Fowler ready to return, it would be tough for the Cardinals to give Piscotty the at-bats he needs to break out of his slump. Thus, sending him to triple-A to get regular at-bats may be the only way of getting him back on track. With Fowler back and Piscotty down, Fowler should resume every-day duties in center field. That will slide Tommy Pham back to left field, with Grichuk and Jose Martinez set to share right field for the time being. Pham has invaluable for the Cardinals this season after starting the year in the minors. On the season, he’s hitting .314 with an OPS of .907. Ideally, the Cardinals would make Grichuk their every-day right fielder. He has responded well to his minor league demotion earlier this and had a strong July, despite missing time with a lower back strain. However, he has slumped the first week of August. Martinez, meanwhile, has been tough to keep out of the lineup at times this year, as he’s hitting .286 with an OPS of .866. Despite the constant swapping of outfielders over the course of the season, the Cardinals are hoping to find some continuity. St. Louis began Monday just 3.5 games out of first place in the NL Central, as both the Brewers and Cubs have failed to run away with the division. The Cardinals are one hot streak away from being neck and neck with those two teams. Getting Fowler back, presumably healthy, could be the team’s key to making a run and becoming a threat in the NL Central coming down the stretch.